Starting in August, 2017, Springwater Trails email is sent using a Google Group. This has several advantages over our old way. You can send emails to the group from your personal email address using your regular email client. Recipients can use googlegroups.com to manage whether they want to receive emails. Each email counts as a single message, allowing the group to send more than one message a day. Sometimes we happen to send two messages a day and Google mail limits us to a total of 500 recipients per day, which is almost exactly 2 messages. Email addresses are not exposed to recipients, providing some privacy. Currently we have set it up to allow only officers to send emails to the group. To send an email from Springwater Trails, you first need to compose the email. In the case of hike announcements, I generally create the web post and then view it in a browser and copy it (Click inside the browser window. Press Ctrl-A to select it all, then Ctrl-C to copy it. Then click in the body of the email and press Ctrl-V to paste it in). Generally the title and the comments need to be removed, but this is a good start. Compose an email the same way you always do. Type springwater-trails@googlegroups.com into the To line. Add a subject. Note that the system will automatically add “Springwater Hiking -” to the start of the subject line before the recipients see the email. In the case of hike announcements, select the title of the story on the website, press Ctrl-C and paste it (Ctrl-V) into the email Subject area. I prefer to remove pictures since they are available on the website. I often add a paragraph of “club news” at the start of the email. If you find typos while reading the email, be sure to go back and correct the original post or event on the website. Proofread the email one last time. Do you find Facebook to be an enjoyable tool? Did you know that you can advertise the Springwater Trails hikes on Facebook? This is an easy way to share our recreation opportunities with your friends and neighbors. However, it has been pointed out that Facebook isn’t always obvious about how to do things. So here are some instructions I have learned. Lets suppose you read something on the main page of Springwatertrails.org that you would like to share. Just now, reading the home page, I saw Ellen’s note about Teasels. The first thing I do, is click on the title of the story. This brings up a page with just that one story. That way I can easily comment on the one story and not confuse my facebook friends. From the Address bar of my browser, I highlight and copy the address to this page. Next, I log onto Facebook, and on my home page, I type a comment into the “What’s on your mind?” box, and paste the address from the address bar. At this point, Facebook goes to the Springwater Trails website and looks at the page. It reads what is on the page, and looks for any pictures. This may take awhile. If you can wait, you will see the pictures. What you will notice is that Facebook finds two pictures on this page. The first picture appears at the top of the page. The second picture is a part of the text of the post. You can leave the pictures as they are, but notice that the first picture has nothing to do with the Teasels. Really, the second picture is the better one. There is an arrow in the upper right that lets you select the desired picture. The final step is to post you comments. When you press Post, you will notice that Facebook removes the Springwater Trails address from your comments, because the box with the picture and description is the actual link. When you post a link on a Facebook Page, things show up slightly differently. Here is how it looks when I post on a Facebook page, rather than on my own timeline. (To find the Springwater Trails Facebook page, search Facebook for Springwater Trails Hiking Page). There are still the two pictures. In this situation, you want to remove pictures you don’t want, rather than selecting the one you do like. You can click on any of the small pictures to remove it, or you can look within the larger pictures an find an X in the upper right corner to delete it. I clicked on the first small picture. When you post to a page, the link address isn’t removed automatically for you. So, you may want to highlight the link and delete it just before you click on Publish. Facebook also has Group pages (Search for Springwater Trails Hiking Group). Posting a link to the Springwater Trails webpage works the same on the Group page and on your personal page. however, it is seen by the people who have joined the group, rather than by all of your friends. I hope this helps you post links to our website. It is a great way to increase our hiking group’s audience. Information herein about Latitude and Longitude coordinates applies for use with a GPS unit, whether using in road travels or hiking. The info also applies for map reading (and map & compass pursuits). Herein is an easily explained primer about Latitude and Longitude. [ For mindset, an example of a listing of latitude and longitude coordinates is: 42.637310, -77.596007 ]. This coordinate notation method utilizes degrees in a full decimal notation or format. In coordinates, latitude is listed first (and then longitude), so consider the coordinate listing system as alphabetical. And if you use the mnemonic “changes in latitudes, changes in attitudes”, as Jimmy Buffet proffers in his song, you can remember that changing of seasons and temperatures is associated with latitudes (thus further north or further south). Continuing further explanation, alphabetically North comes before South, and likewise North is over South, thus the southern hemisphere (southern latitudes) being below the equator has an assigned minus (-), while the northern hemisphere (northern latitudes) where we in New York & all of the US are has no preceding minus (-) in latitude. In coordinates, longitude is listed second (read last). In longitude, the US is in the minus (-) half of longitudes, it lies west of the Prime Meridian. (The Prime Meridian is an imaginary north/south axis line labeled as longitude zero; it passes thru Greenwich, England the site of the Royal Greenwich Observatory.) Being that the continental US (and Hawaii, most of Alaska, and North & South America) lies to the West of the Prime Meridian, the US is in the western hemisphere and considered West Longitude. Again alphabetically, East is before West so logically the latter (West Longitude) gets a minus (-) assigned to it in longitude, while East Longitude (think Europe, Asia, Africa) has no preceding minus (-) in longitude. What lies 180 degrees, half way around the globe from the Prime Meridian, you ask? Well, it is the antimeridian aka the 180th meridian aka 180th parallel. What about the “International Date Line” (IDL)? Well, the IDL roughly approximates the antimeridian, but deviates to pass around some island groups and territories. No time herein to start talking about “time zones”, but there are commonalities to meridians. What about Greenwich Mean Time (GMT)? Yep, related to that Prime Meridian, but again not talking about it herein. Close to home, utilizing this latitude/longitude coding system in degrees and decimal, the “four corners in Springwater, NY” can be represented as approximately 42.637310, -77.596007 This decimal notation is but one of a number of ways to code latitude and longitude. Utilizing degrees, minutes, and seconds of measure is but another, and it is this system (degrees, minutes, seconds) that is more likely utilized on a traditional paper map. You can see the latitude/longitude system as a type of grid. Visualizing can make for easy, “ah-ha” understanding. Cropped from an article, the latitude/longitude grid of the continental US (below) may help you to easily identify with the concept. The cropped segment is provided chiefly for viewing the grid, but if you wish you can take up on the accompanying prose, and even take a look at the article in entirety. The prose accompanying this grid does not utilize decimal listing of lat/long, it uses degrees, minutes (‘), and seconds (“). The decimal listing of lat/long is most easily utilized in a GPS unit geared toward driving destinations. If you know more than you did before reading this segment, Great!, … and now you can consider it as a primer for when S/T hikes may utilize navigational coordinates (aka Lat/Long coordinates, aka GPS coordinates), … perhaps a future hike with a Geocaching or Orienteering component. The map shown above only shows the major degrees. However as you can see, even the coordinates 34° N / 118° W will enable you to sight fairly quickly on the map where Los Angeles is located. If we had a map which indicated ‘minutes’, then you could distinguish down to approximately a mile. If the map indicated “seconds”, then you could pinpoint the exact center down to approximately 100 feet. 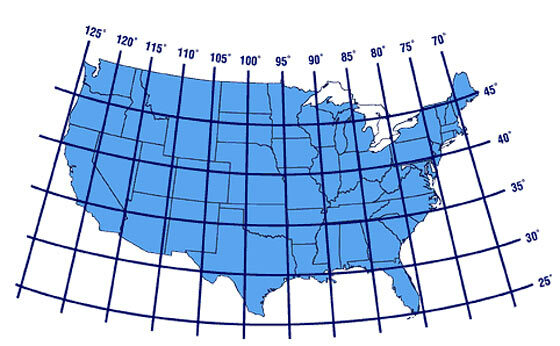 Think of it as grids within grids… It’s just a matter of having the right map which overlays latitude and longitude down to the resolution that resolves for your purpose.